Cesar Vialpando explaining the rules of the race to Carl Johnson. Finish a lowrider race first. 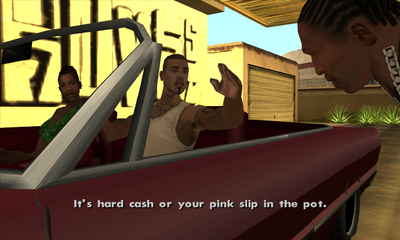 High Stakes, Low Rider is a mission in Grand Theft Auto: San Andreas, given to protagonist Carl Johnson by Varrios Los Aztecas gang leader Cesar Vialpando from his home in El Corona, Los Santos, San Andreas. Carl gets a lowrider car and drops by Cesar's house in El Corona. The two drive to the street race's starting point near the Commerce district and race against four other cars. Carl then traverses through the districts of the western part of Los Santos, before reaching the last checkpoint in Santa Maria Beach first. He then wins the race and earns a monetary reward. Cesar Vialpando: Heeyy, CJ, you made it! Carl Johnson: What's the bi'ness? Cesar Vialpando: Nice ride, man. That's no carrucha! You sure you want to risk that baby? Carl Johnson: Yeah, I'm sure. How much they talking about? Cesar Vialpando: It's hard cash or your pink slip in the pot. Con Safos, eh. Then you pull up and race. First past the post wins, con chota, sin chota. Carl Johnson: OK, for sure, I'm down. Carl Johnson: Yeah, well me either. Cesar Vialpando: Follow me to the race, dude! The reward for this mission is $1,000. The race may be later replayed as part of the Los Santos Race Tournaments, which can be accessed in Little Mexico. Despite the race requiring a lowrider, two of the opponents are driving Majestics, which aren't classified as lowriders. The other Ballas gang car, the Tahoma, is a lowrider, however. Cesar Vialpando pulls out of his garage with Kendl and head for the lowrider street race with Carl Johnson. Carl's lowrider approaches the finish line. This page was last modified on 17 June 2015, at 22:42.